So you have suddenly realized that making money with your blog may be a good idea. Of course, it is! Turning your creative skills and enthusiasm into a source of income is awesome. Moreover, a smart approach can bring you real money, even if you are a young writer and lack experience in monetizing blogs. If you are ready to grasp the thistle firmly and work hard to become a blogger, then start with reading this small guide. Let’s start with some inspiring examples. Did you know that some influential bloggers are as young as 13-16? The reason is trivial: teenagers are successful at creating new worlds apart from adults. The Internet provides a great opportunity to become anyone you want to be, therefore millions of new blogs are created every day and a part of them are made by students, like you. Some of them try to imitate the adult voice, while the others are real diamonds in the rough. Oftentimes, some of them make an Internet buzz and earn the interest of the blogosphere for a long time. These blogs attract thousands of fans from all corners of the world, allowing their authors to locate advertisement on their resources and therefore earn money. For example, the author of a well-known fashion blog Style 'Rookie Tavi Williams' is a 13-years girl, who became an influential figure in this competitive niche. Today, she is a queen of teenage bloggers and even the fashion houses pay special attention to her activity. At the beginning of her career, there were rumors that the real author of Style Rookie is an industry expert, but it turned to be that Tavi is a 13-year-old girl, who really has something interesting to tell. Her audience goes far beyond teenagers. Adults are also interested in what teenagers have on their minds, as well as businesses and marketers. In a word, various segments of society are interested in teenage blogs. They need opportunities to look inside the life of young people and therefore find fresh insights and discover new territories. Some teenagers start writing blogs because they feel lonely and search for contact with other kids. The others have specific interests and want to share their thoughts with others. Both have chances to get far. Getting successful is usually connected with self-promotion, quality of content, and luck. 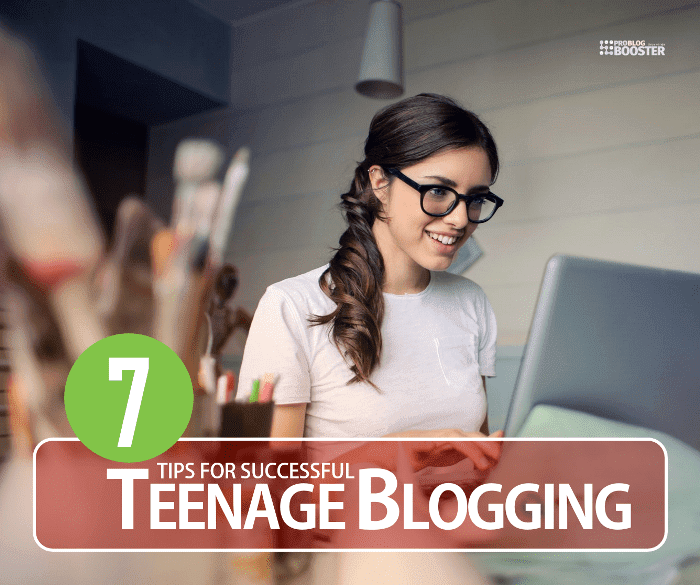 What should you do as a teen blogger to make your blog better? The exciting & most enthusiastic young bloggers are publishing the content about everything from fashion to technology to photography to everyday life, writing several pages and getting authority as a teenager. There is no way you can create a successful blog without planning. Take care of the strategy and make a research before you start. You must have a complete vision of your future blog in your mind. Analyze the preferences of your potential audience, think about your writing style/voice and take a specific angle. In some sense, you should also keep in mind such things as a logo, content pillars, and a tagline (in an ideal scenario). Also, it is extremely important to have a close look at the active bloggers, who work in the same sphere as yours. If you are worried that nobody takes teenagers seriously and you need to act like an adult to be noticed – forget about this. Your teenage status may become your secret weapon, so don’t miss this amazing benefit. Young people receive opportunities that nobody else can have. Your writing talent looks even more impressive when you are a teenager. It’s not like your youth will do the work for you, but it is an advantage, not a limit. Of course, you won’t get anywhere without a high level of expertise and… a deep research, as we have already mentioned above. Communication is going to be a part of your activity, even if you are a natural-born introvert. Once you start, you have to infiltrate into a blogosphere by making connections with experienced authors. Be aware that becoming a really successful blogger is connected with an even broader type of networking. They visit conferences, give speeches and interviews. But don’t panic, if you think that you are a shy type. The secret is not struggling with your personality, but evoking interest about others. Of course, interest doesn’t always come naturally and sometimes it is a skill that has to be mastered. Even the coolest writers and bloggers were beginners some time ago. Also, any professional sphere is complicated and you will need clarifications about things you don’t understand. Otherwise, you will hardly get anything. Don’t be afraid to ask people, who have experience and knowledge, about topics that you cannot grasp. Do so, even if you think that your questions will make you look silly. People will respect you for your motivation to learn and the willingness to admit that you don’t know everything. Developing content on the regular basis is absolutely necessary. Even if your college assignments are stressing you out and your writing papers doesn’t seem perfect – keep on doing it. First, practice improves skills and helps you recognize your weak points (and learn from mistakes). Second, this will keep your audience engaged. The best strategy is to have a schedule and make writing your everyday practice. This is a part of your life and you should perceive it as a ritual. Check out; 10 Way, How High-Level Writing Skills Help In Marketing? Yes, blogging is hard. Sometimes you feel disappointed about the results or people don’t pay too much attention to what you do. Time passes and nobody wants to pay for your texts or locate adds on your resource. Sometimes, you are too tired or overwhelmed. College gets in your way when you just want to work on your new draft. Chances are, that you will face challenges you have never faced before. However, you must learn to turn it for your own good and perceive difficulties as chances to get stronger and move forward. There are hundreds of things that can go wrong with your blogging career because things never go perfectly. Still, you will learn something new and reach incredible moments of success and enjoyment along the way. Remember that perseverance is everything. The stories of successful teen bloggers are amazing, but none of them had considerable income at the beginning of their way. Maybe, you will need a year or more to make your blog grow. Thus, hard work and enthusiasm will keep you going and this is what a blogger’s life is about – doing what you love and becoming better every day. Mastering the art of a written word is amazing of its own accord. We believe that you will find something even more rewarding than money once you get working.